The Utah tourism rep tells me that her two biggest challenges in promoting the state are convincing people that they can actually drink there, and that they won't be converted to Mormonism during their stay. As a devout believer in golf and drinking, I take a deep breath and start enjoying my weekend in Park City. I'm in town for the 11th annual Park City Food & Wine Classic -- a city-wide celebration of 100+ local and out-of-town distilleries, wineries, breweries, food artisans and restaurants. But during my two-day stay, I'm mainly here to play some golf. It's pouring buckets as my friend and I arrive at Victory Ranch Country Club, a private Rees Jones, 7,600-yard design that opened in 2010 in rural Kamas, about 25 minutes from Park City. But that just means we will have the course to ourselves. In fact, everyone from the front gate guard to the bag guys to the pros in the golf shop warn us that there's no immediate end to the downpour in the forecast. Joke's on them, as the rain abruptly stops right after our first tee shot and never returns. I birdie No. 2 and eagle No. 3, miraculously sinking putts of 80 and 60 feet, respectively. Clearly I'm already loving this place. But my personal success is not the only reason I'm developing a favorable opinion. This is truly the single-best conditioned course I have ever played. Bar none. And believe me, I've been incredibly fortunate to play about 25 or 30 of the world's top 100 courses. There is not a blade of grass out of place here, and zero patches of thin grass and dirt anywhere. The rough is for the most part so well packed that any ball landing in it sits up nicely. Yet where there isn't rough flanking the fairways, there's scrubby straw-like plantation that you cannot hit from. So it's feast or famine. All that into account -- and admitting that I find many of Jones' courses to be over-challenging -- Victory Ranch is probably the most wide-open and forgiving of his designs that I've played. 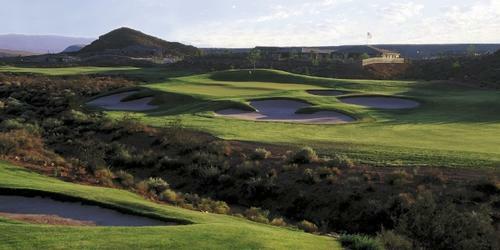 There are tons of elevation changes throughout, as well as some long tee-shot carries over canyons. The scenery of the bright green fairways visually popping out against desert-like outskirts; the vistas of distant mountains; and the various red rocks around make this a spectacular setting. The course has a nice flow to it. There isn't much water on it, but there's enough to keep you alert. We run into only one other group, which lets us play through. I particularly love the finishing hole, a downhill and long par-4 that can play into the wind. I would probably rank this course among the top 10 or 15 I've ever played. The challenge is just really solid. It's a very well-thought-out design, and I'm duly impressed. As an added note, there's one cabin on the front nine and an identical one on the back that's loaded with food, drinks and snacks for members and guests. Jars of gummy bears, Swedish fish, Skittles and other candies flank the freezer that has one compartment solely full of frozen Snickers bars and another with Good Humor ice cream bars. Another fridge is packed with drinks. The counter has a Keurig machine and huge selection of coffees, while cabinets are stocked with chips, protein bars, and pretty much anything you'd need. It's one of the most well-thought-out additions to a course I've seen. One final accolade: For such an exclusive course, the people working here could not be any nicer. A truly fantastic experience from start to finish! 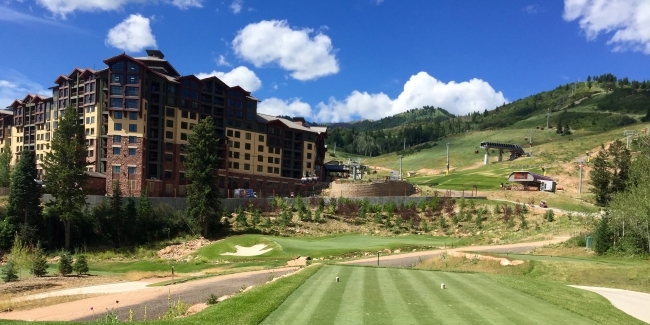 The next morning, I head right outside the back door of the hotel I'm staying at, the beautiful Grand Summit at Canyons Resort, to play the 6,005-yard Canyons Course. The temporary pro shop is actually in the hotel lobby. We check in and then head outside to this 6,005-yard resort layout that just opened in June. Designed by Gene Bates and his nephew Casey, it's built around the resort's mountain, but is in no way an easy resort course. It's kind of a combination mountain-resort-links-style course depicted by very few flat lies, plenty of lightning-fast greens and several blind shots. Dirt cart paths that border every green are playable and frankly they need to be, as many balls end up on them. The high mountain elevation adds shot distance -- that's the good news. The bad news is that the course is rather tight and winding, so lost balls are plentiful -- particularly on the hilly front nine. The 10th hole is a driveable 503-yard par-5 -- a 550-foot drop easily eliminates half of the hole's distance. But if you're even a yard off target, you could well lose your ball. Thus I think the hole's par rating accounts for probable penalty shots. From there, the course is much more tame. In fact, the 12th hole is a straight par-3 that's the first linear hole on the course. There are actually seven par-3 holes and four par-5's. Thus, total par is 69. But you can't expect a cakewalk. Every hole has some degree of challenge, yet is completely playable for all skill levels. If you go in expecting high scores, crazy bounces, gravity-defying putts and lost balls, you'll have a great time. Even better players probably shouldn't take their first-time results too seriously. You encounter water twice on the course -- once on each nine. It's nearly impossible to two-putt many of the greens where the pins are located the day I play. I chuckle to my friend that with some of the pin placements that I'm facing, I really think I'd need to lay up a putt, just to be able to two-putt from that point. The conditioning is outstanding, though. And especially considering that the course is brand new, many of the bounces and rolls are still true. I'd love to come back in a few years, once the grass and plants have matured some. The greens will probably have slowed down by then. Bottom line is that good shots will be rewarded, and bad shots will be punished. The panoramas throughout are jaw-dropping. I'm happy shooting an 82, and really enjoyed the course. Scott Kramer, former senior editor of Golf Magazine, is a freelance golf equipment writer based in Carlsbad, Calif. - the unofficial capitol of the golf equipment industry. His work can be found on a regular basis in publications, such as T&L Golf, PGA Magazine, Met Golfer, Golf Tips and Private Clubs.